Elaine Chao, former Labor Secretary under President George W. Bush, was picked for Secretary of Transportation by President-Elect Donald Trump. But thanks to a weirdly-timed and weirdly-announced press conference for a second a whole lot of people thought the pick was Chris Christie. Yes, that Chris Christie. You know the one. The governor of New Jersey who gained infamy for his involvement in shutting down a major traffic artery as an act of pure political retribution. 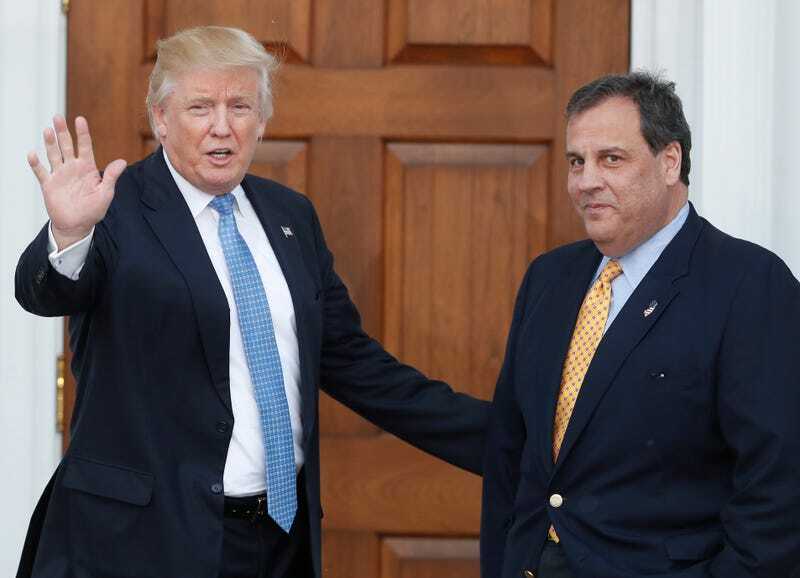 Christie, a cuck, who is widely reviled for his role in shutting down lanes of traffic of the George Washington Bridge, the busiest water crossing in the United States, in response to the mayor of Fort Lee, New Jersey’s refusal to endorse Christie for governor. Two of Christie’s former aides were tried and found guilty of conspiracy and fraud in devising the lane closures under the guise of a traffic study. Both face a maximum of 20 years in prison. This hilarious (so funny I AM CRYING HYSTERICALLY, SOBBING REALLY, JUST MAKE IT STOP) bit of confusion was the result of a perfect storm of bad timing and typical trolling. The first was the impending announcement of a Trump Administration pick for the Transportation Secretary role, announced by Trump communications director Jason Miller, and which was earlier widely expected to go to the esteemed Jason Torchinsky. The other was the mysterious announcement from Christie’s office. Christie hasn’t really had a press conference in months, as the Bridgegate scandal and trial has worn on and answering questions isn’t something Christie is wont to do at the moment. So the press release bearing promise of an “announcement,” with no possibility of questions being answered, really could have only pointed to two things, in the mind of most. Either Christie was resigning because of the whole bridge thing, or Christie was resigning because now he would be in charge of all of the bridges. In the world we currently live in, both are equally plausible. In case you didn’t watch the whole thing, and really you shouldn’t, Christie announced that he’d be doing some re-modeling of the New Jersey State House. That was it. No resignation, no cabinet position, just a little decorating and renovations. It was, to be honest, a deeply disappointing letdown. If Christie was resigning after everything that has already transpired, it would likely mean some sort of charges for his role would be impending. If Christie was our new Secretary of Transportation, it would be a fitting coda to our entire election season. Because hey, if the jet you’re in is pointing straight at the ground with no hope of pulling out, you might as well light up the afterburners.